Looking around the web-o-sphere I spotted some interesting nuggets for your perusal, so check the wreck on the street art news round-up. 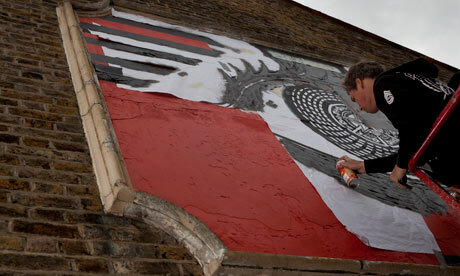 Up top we have Shepard Fairey of Obey fame commissioned to do a mural in North London, courtesy of the Guardian. The event organizer is surprised he decided to do the work in such an out of the way location, then chalking it up to "an old London thing." Of course they referred to Banksy, citing him as Obey's UK equivalent, I guess they needed to drop his name somewhere in the article. Which brings us to our next story, not all Street Art is Banksy, courtesy of Laist. Good point, although it is sad that we must point such things out, perhaps if it is not Banksy then it must be Shepard Fairey, just kidding. Funny enough the Banksy-like piece in question is being attributed to Mr. Brainwash. Oh, they do love their celebrities don't they. This is where we all fawn loudly, awwwww. Detroit is getting a Street Art facelift and as you guessed it not everyone is happy. When is everyone going to be happy? That is a rhetorical question in case you felt possessed to answer. Never could be a suitable response if you did venture a reply. When people were concerned about tags ruining the murals others advised good graf gets respect. In many cases this is true but sadly in prepping this blog I did come across a defaced Roa that made me shed a dry tear. BTW, definitely click this link, there is a snappy slideshow well worth your time. On the topic of defacing art we take you to a video out of Houston where a vandal touched up a Picasso and posted the act on Youtube. Oh what some do just to get a rep a la Gang Starr. Gonzo247 speaks on camera and gives the newstypes what they want to hear, ya' hear. Not sure what that means but I'm gonna leave it. As a matter of fact even though there is tons more news to report for now I am going to leave you. Enjoy your day, week, month, year, life, all that!